After an interval of time filled up by military movements below criticism, because they were made, not upon strategical and tactical, but upon diplomatic and parliamentary grounds, the investment and attack of Silistria affords at last an event of military interest. This attack shows that the Russians still keep the initiative, and that, up to the present moment, the Turks, allied armies and allied fleets, are directed by an impulse received from the enemy. The allied fleets are instinctively, irresistibly attracted by the Russian fleet in its safe retreat at Sevastopol; being unable to attack that stronghold without a land force, they are thus held in check and paralyzed by a fleet far inferior in quality and number of ships. Even the evacuation of the forts on the Caucasian coast, carried out in proper time and under the nose of the British and French steamers, shows the determination of the Russians to hold the lead as long as possible. And in war this is a great thing. It is a proof of superiority whether in numbers, in quality of troops, or in generalship. It keeps up the morale of the soldier under all checks and retreats short of the loss of a decisive battle. It was this initiative which held together Wellington's little army in the midst of hundreds of thousands of French troops in Spain, and which made it the center around which all the events of that five years' war grouped themselves. You may be forced to retreat, you may suffer a repulse, but as long as you are able to give the impulse to the enemy instead of receiving it from him, you are still to a degree his superior; and what is more, your soldiers will feel themselves, individually and collectively, superior to his men. The attack upon Silistria is, besides, the first real forward movement of the Russians since they completed the occupation of the Danube. The entrance into the Dobrodja was eminently defensive; a shortening of their front line, and a step to secure the mouths of the Danube. But the attack upon Silistria is not only a bold, but an extremely well calculated movement. In 1828-29 the Russians, then masters of the Black Sea, very properly neglected Silistria in order to secure Varna first, because Varna opened a new line of sea-communication with their own country. Yet Silistria was important enough to induce them to take it before they crossed the Balkans. At present, when the allied fleets command the Black Sea, Varna loses most of its importance to the Russians, and Silistria and Shumla are the main points of attack. To them Varna can now have but a negative value; if they take it, they gain no improved base of operations, but merely deprive the enemy of what may be called a maritime bridge-head, under cover of which he can suddenly concentrate, by his ships, a number of troops for a special operation. Thus the Danes in 1849, after enticing the Prussian army into Jutland, suddenly transshipped a strong body of troops to their maritime bridge-head of Fredericia, and, in a sally, destroyed the fine, but far weaker Schleswig-Holstein corps left before it to conduct the siege. If therefore the Russians, driven from the Black Sea, cannot under any circumstances pass the Balkans before they have secured Varna, they cannot advance against Varna before they are masters at least of Silistria. But these are considerations of secondary importance for the present; Russia, unaided by Austria, cannot think of passing the Balkans in the face of her present enemies. The defensive importance of Silistria to the Russians is at this moment paramount; it is such that unless they take it, they may consider their campaign of the year as lost. Silistria is situated exactly in front of the center of the Russian position, extending from Giurgevo by Kalarash and Chernavoda to Kustendje. With a strong system of fortresses before this position, with Omer Pasha iii Shumla, like a spider in the center of its web, watching every movement of its intended prey, with allied forces expected on the Kamtchik and Devna, there is very little chance that the force Russia can spare for the Danubian war, single-handed, will ever get a glimpse of those Thracian valleys whose verdure charmed the fatigued soldiers of Diebich from the hights of the Balkans. Russia must calculate, for this year at least, upon a simple defense of her present conquests, until either Austria joins her, or some circumstance disables or draws away her most formidable opponent, the Anglo-French army. A defensive war presupposes a system of field, or, if possible, of permanent, fortifications. Now, Silistria being in the hands of the enemy, the Russians have no permanent fortifications at hand but the small forts of the Dobrodja, which will be entirely useless as soon as Wallachia is lost. They may have reconstructed some of the fortifications of Ibraila and Rustchuk and formed an entrenched camp at Bucharest, but as long as Silistria is not theirs, their first line of serious defense lies as far back as the Sereth, Fokshani, Galatch and Ismail. But suppose Silistria in the hands of the Russians, the aspect of the war changes at once. Silistria is a splendid point for a Russian bridge-head on the Danube. It is situated in a reentering angle formed by a bend in the Danube, just the situation best fitted for the purpose. There is a large island to the north and west, which is crossed by the dyke to Kalarash, and which commands the plains west of the fortress, at a distance of 1,000 yards quite near enough to enfilade trenches or to shell columns. There are two little islands to the east that sweep the eastern approach, and temporary batteries erected there at low water would annoy a besieger very materially. Thus part of the ground which the Turks, attacked from the north, cannot use in the defense and must therefore abandon to the enemy, would give the Russians excellent positions for batteries flanking an attack coming from the south. The front open to an attack would thus be confined to the base of the triangle, at the apex of which Silistria is situated, or in other words to its southern or land front; and a Turkish or allied army could not think of seriously attacking Silistria before Wallachia, at least, was taken from the Russians. The main advantages, however, would be not so much of a tactical as of a strategical nature. With the Dobrodja and Silistria, Russia commands the Danube, and can, according to circumstances, debouch for momentary offensive action either from Trajan's Wall, or from Silistria. The enemy would not be able, unless he were twice as strong as the Russians, to cross at any point higher up without exposing Shumla. As to his crossing lower down than Silistria, it is out of the question; there is no crossing point nearer than Hirsova to reach which he must first take the position of Karasu and then Hirsova itself, which is as strong against an attack from the land side as it is weak against one from the river side. Thus by the possession of Silistria, the forts of the Dobrodja become of great importance to the Russians. Their army obtains a double pivot around which it can freely maneuver without exposing its communications, and even if a superiority of two to one should enable the enemy to cross at Oltenitza or Giurgevo to take Bucharest and to repel the Russians behind the Jalomitza, the siege of Silistria would be an indispensable operation before any decisive advance into Bessarabia could be considered safe. Until Silistria had actually fallen, the Russians, therefore, might consider themselves as possessors of Wallachia even if they had not a soldier in that province. Silistria, in a word, would be equivalent, to Russia, to six months tenure of Wallachia and six months, bringing us to the winter when no sieges can be carried on at all in that country, would be equivalent to four months more. Silistria would be the winning, and a repulse from Silistria would almost be the loss, of the campaign. For once, then, in spite of diplomacy, bribery, cowardice and irresolution, we are come, through the inherent necessities of the war, to a decisive turning point. Either Silistria is abandoned to its fate, and then its fall is a matter of more than mathematical certainty; or the allies advance to its relief, and then there will be a decisive battle; for without demoralizing their army and losing all their prestige, the Russians cannot retreat from before Silistria without fighting, nor do they appear willing to do so. Silistria has undergone more varied fates than any other fortress. In 1810 the Russians took it after nine days' investment and five of serious attack. In 1828, the fortress being exactly in the same state as before, they invested it on the 21st of June with their land forces, and on the 10th of August with thirty-six gun-boats also. But their siege-artillery did not arrive till September, and then there was no ammunition with it, so that a regular attack could not be made. On the 10th of November they had to raise the siege, the winter having set in, and the Danube having begun to drift ice. The retreat of the disorganized and disheartened Russians was followed up most vigorously by the garrison; part of the Russian siege-artillery had been left in the batteries and the remainder was taken by the Turks in the pursuit toward Rassova. In the next year Diebich renewed the attack, invested the fortress on the 7th May by driving the Turks out of the lines and redoubts constructed by the Russians the year before, and opened fire from thirty-one heavy guns placed, it would seem without any preparation, on an elevation about 900 yards from the town. On the 26th dismounting batteries were opened at about 600 yards from the wall. At the same time the second parallel was opened; the third was opened on the 4th of June, and on the 12th the advance toward the crowning of the glacis was begun. The glacis was crowned at one point on the 17th, but this operation was completed on the 26th, only when five batteries were opened at the very edge of the ditch, thirty yards from the main wall. At the same time General Schilder, the same who now directs the engineering part of the siege, had carried on his favorite extensive mining operations. Large mines laid under the counterscarp and the main wall had been sprung on the 21st (effecting at once a practicable breach), on the 25th, 27th, 28th and 29th, when at last the fortress surrendered. Even then there appears not to have been any urgent necessity for a surrender, save the terror produced by the subterranean explosions among a superstitious and irregular soldiery. Behind the whole attacked front and second rampart a coupure or new intrenchment had been made, which would of course have required fresh mining or artillery operations before it could have been taken. Thus this singular fortress, in no way improved upon its state in 1810, had yet held out thirty-five days after the opening of the trenches, and nine days after a practicable breach had been effected in the main wall; it had forced the Russians to expend 30,000 shot and shell in the artillery attack, and 336 hundredweight of powder in the mining attack. The bridge-head was an impossibility, the island belonging to Wallachia, from which the Turks were excluded by treaty; but the forts are there, and if we are well informed, almost on the identical spots pointed out by Major Moltke. What Col. Grach may have been able to do with the faulty main wall, we cannot tell. There is, however, hardly a doubt that he must have constructed at least a covered way and introduced loop-holes for enfilading the ditch at the middle of the curtain in each of the most menaced and least defended fronts. As to the four detached forts, we know nothing as yet respecting their mode of construction, but from Col. Grach's being a Prussian, and cheapness being a great object with the Porte, we should say they must most likely be constructed upon the system which is now almost generally adopted on the continent, and especially in Prussia, viz: plain square or octagonal redoubts with loop-holes on every alternate corner. Their situation is pointed out by the four promontories which form the final projections of the plateau toward the town, and which are separated by three ravines. Their distance from the main wall must be, on an average, 1,500 yards so that they cannot be very effectually protected by the fire from t he fortress. But there is no absolute necessity for this; and there appear to be no spots nearer the town, on the slope, where fort could be well defiladed against the commanding edge of the plateau. Beside these permanent works, Col. Grach has constructed on the plateau itself an earthwork, not of a permanent nature, called Arab Tabiassi, (Fort Arabia,) situated in front of the two central forts, at about 1,000 yards distance. Some reports would lead to the conclusion that other field-redoubts have been erected so as to form an outer' line of forts, thus giving three lines of successive defense. Arab Tabiassi, however, remains the key of this position, and must be taken before the inner line of forts can be approached. This disposition of the works endows Silistria with great defensive and offensive strength. As the regular attack can lead to decisive results on its southern- front only, a garrison from 15,000 to 18,000 strong can spare a great number of men for sallies. The sally troops find a splendidly covered position on the slope behind the detached forts, from which they can advance unseen up the ravines, until near the enemy. In a storm upon Arab Tabiassi, therefore, it would not be so much the garrison of that fort as the sallying troops from Silistria who would decide the battle. Now to the siege itself. From the end of April the Russians had occasionally fired across the Danube into Silistria. In May they began to construct a regular approach on the large island opposite the town, close to the dyke leading to Kalarash, and by the 10th they had their batteries completed along the shore of the river. A violent bombardment against the town as well as horizontal firing against the northern front took place on the 11th. It was repeated on the 12th, when Lieut. Nasmyth, Bengal Artillery, who had just arrived, witnessed it, and gives his report in The London Times[c]. 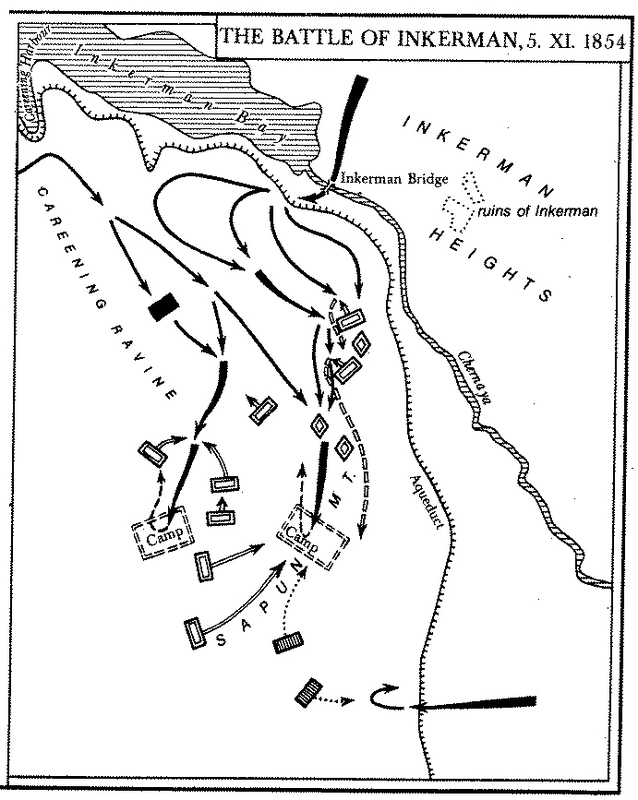 The main point of aim was the northeastern or Tshengel Bastion, from which the Turks replied most vigorously, and with great steadiness of aim. The practice of the Russians, on the contrary, is described as very indifferent. Numbers of shells were found in the town which had been fired without taking off the caps of the fuses, so that they could not take fire and explode. Such an oversight, though common in rapid field-practice in the beginning of a campaign, is unheard of .in siege-firing, where the fire is always comparatively slow. It proves what a hurry the Russians must have been in to get rid of their ammunition. The Russians had, besides, erected batteries during the night on the island of Shiblak, to the east of Silistria. (They had two batteries on the same spot in 1829.) The four guns of this battery must have been intended to enfilade the whole of the northern front. From the 13th to the 16th nothing much appears to have been done; the reports at least are .entirely silent. It is not improbable that the Russian generals, finding, as they might well have expected, a bombardment of no avail against a Turkish fortress, prepared for an attack on the right bank of the river. Accordingly on the 16th a bridge was completed below Silistria; 20,000 men crossed on it, and were shortly afterward joined, it is said, by 20,000 more from the Dobrodja. 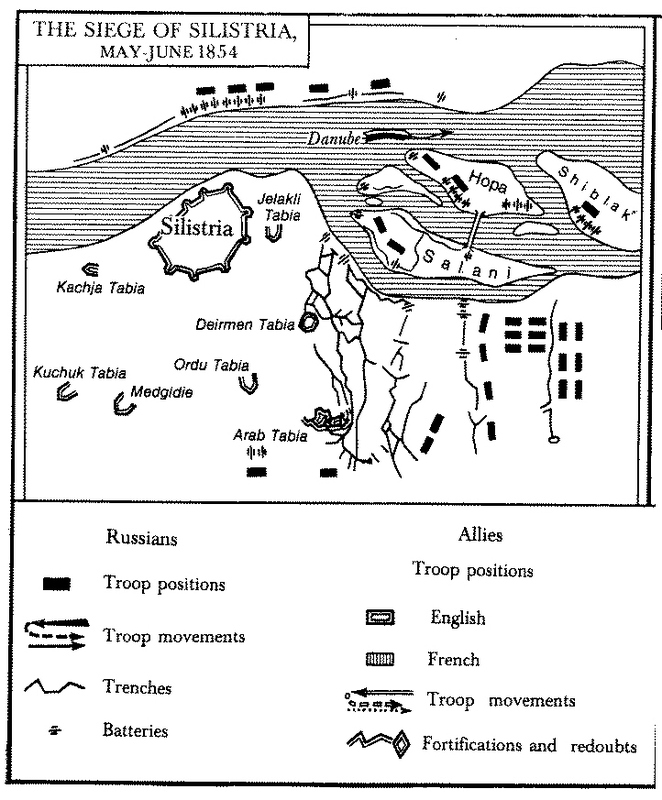 A general movement of concentration toward Silistria and Turtukai took place among the Russians; for as soon as the attack was to be carried on upon the right bank, a force was necessary to cover it against Omer Pasha at Shumla, and any Anglo-French troops which might be landed at Varna. On the 19th the first reconnoitering took place against Arab Tabiassi; large masses of troops were concentrated just out of gun-range, while a line of skirmishers advanced. After a short - cannonade, Mussa Pasha sent some Bashi Buzouks upon the plateau, who drove the skirmishers in. On the 20th, another Russian advance took place, which looks too serious for a mere reconnoitering not serious enough for a real attack. On the 21st the first assault upon Arab Tabiassi was carried out; the details are wanting, but the Russians were repulsed with great loss. Two Russian officers passed over to the Turks, and reported the enemy to be 90,000 strong, combined from three army-corps (this is correct, the 3rd, 4th and 5th), and to be commanded by the Grand Duke Constantine. This latter statement is evidently a mistake, as Constantine is notoriously commanding the fleet, troops and coast defenses in Finland. The report of an intended renewal of the attack on the following day was not confirmed by the event. The Russians were under arms, but did not approach the fort. We are, then, again without news of what happened up to the 26th; but at daybreak on the 27th the Russians assaulted the Arab Tabiassi again with very considerable forces. Three times was the assault renewed, and three times the assailants were repulsed with immense loss. The Turkish reports speak of. 1,500 killed, and 3,000 wounded Russians, which may be a little exaggerated, but is not much beyond probability. Determined to take the fort, à la Suvoroff, the next morning Paskievich had his columns again ready for the attack. The massacre appears to have been fearful; Gen. Selvan was killed. Col. Count Orloff, Jr., was shot in the eye and died afterward. Another colonel was severely wounded. The Russians themselves admit a loss of 186 dead and 379 wounded; but this is evidently not one-third of what they must have lost; with the masses they brought to the attack, a loss of 2,000 is the least they can have suffered. In the night following the Turks made a sortie in mass, fell suddenly on the Russian lines and drove the Russians back with great loss (1,500 to 1,800, as the reports go). This successful sally, and the circumstance that on the last assault the troops could not be brought up too close, although the cavalry was employed in driving them up and cutting off their retreat, made Prince Paskievich resign the attempt to carry the place with the bayonet. There is no doubt that the defense of this redoubt is one of the most glorious feats of arms, not only in this, but even in all the Russo-Turkish campaigns. The ground admitted of an attack by very large numbers, and the Russians are not the men to omit sending as many thousands to a storm as they possibly can. The superiority of numbers on their part must, therefore, have been very great, and required not only brilliant gallantry, but also well planned and harmoniously executed sally operations on the part of the Turks to repulse it. There is hardly a doubt that against the Turks of 1829 the Russians would have carried the place. Their present repeated defeat shows that the Turks, at least part of them, have improved in tactical proficiency and military science, without losing any of their bravery. In this respect the defense of Arab Tabiassi and the engagement of Chetatea are the most remarkable affairs of the campaign. As to the Russian attack, we cannot say much good of it. Paskievich appears to be in such a hurry to take Silistria that he has not even time for measures the most indispensable to effect his object. His irresolution is plainly betrayed. First he tried a bombardment, though he might have known how useless that is against a Turkish town. A bombardment can lead to nothing but a great loss of ammunition to the Russians, with perhaps a breach in the wall on the river front, where the vicinity of the Danube, a natural ditch of 1,000 yards wide, prevents all idea of a storm. Then the land front is attacked, but the fire of Arab Tabiassi appears never to have been silenced nor any serious attempt made to ruin its defenses. All that is too circumstantial for a successor of Suvoroff. As said that arch-Russian general, "The bullet is a foolish girl, the bayonet is a brave fellow," and if this is true with regard to the Russian bayonet, which, according to the same gallant authority, pierces through the Alps, it is certainly still more true with regard to Russian bullets, which have an invariable and irresistible tendency to deviation. So the storm is ordered, executed, repeated, and again repeated, in vain. It appears that the earthen parapets of a small but strongly built Turkish fort are harder than the Alpine granite, against which Suvoroff fought, and that the balls and bullets of the Turks are not so foolish as those of the Russians. After all, Paskievich will have to return to the old maxim: Never storm a work before silencing its fire and ruining its defenses. Thus, about the 30th or 31st of May the regular siege begins, and Paskievich at last has recourse to the "foolish bullet." But, no! this even is a mere show. Here is Gen. Schilder of 1829 notoriety, who promises to bring down the place with his eternal mines; and in a few days too. Mines against a field-work are the last expression of military despair, of ignorant rage brought to bay. If mines are to be employed, then, in order to be able to work them with effect, the primary condition is that the glacis be crowned. Before the glacis can be crowned, the enemy's fire must be silenced; that is, one, two, three parallels laid, with all their respective batteries. In fact, mines are the concluding operation of a siege, not its beginning. Unless Schilder proposes to undermine some twenty square miles of ground, or lay a tunnel under the Danube, he cannot escape the necessity of a regular siege. In spite of Suvoroff, the bullets are indispensable. Now, a regular siege against Arab Tabiassi might be certainly concluded in a very few days, as the work has almost completely fulfilled its purpose and a prolonged defense would weaken the garrison too much. But this would be a regular siege against at least two forts, and then another against the town. Five weeks is certainly the very shortest time in which the Russians can complete this, slovenly as they are in siege operations. If, then, the Turks should have plenty of provisions and ammunition, and no unforeseen accidents should occur, the fortress may be considered as safe up to the beginning of July. We suppose, of course, that the forts are of an average strength and that the walls are not too much out of repair. But if Silistria stood 35 days of opened trenches in 1829, surely with the new additions, with a brave and intelligent commander, an experienced director of artillery, and a first-rate garrison, it will be able to stand at least as long in 1854. If it were possible to rely on the allies, we might safely say, therefore, that the campaign must prove a total failure for the Russians, if not a great deal worse. [b] Moltke, Der russisch-turkische Feldzug in der europäischen Türkei 1828 und 1829, S. 206.—Ed. [c] [Nasmyth.] "The Siege of Silistria". The Times, No. 21762. June 8, 1854.—Ed. The mailing of this article to New York written by Engels in the evening of June 10 is entered in the Notebook as "13. Juni. Belagerung von Silistria". The reference is to an episode in the Danish-Prussian war of 1848-50. Bashi Buzouks—irregular detachments of the Turkish army in the eighteenth and nineteenth centuries; the name was also given to troops noted for cruelty, plunder and lack of discipline. This information did not prove true. Count Nikolai Alexeyevich Orlov, who stormed Silistria, remained alive.